What a difference a day makes. On April 9, the day before JPMorgan Chase CEO Jamie Dimon was to testify at a House Financial Services Committee hearing along with six of his fellow mega bank CEOs, his legions of publicists and handlers still thought there might be a presidential run in his future. Today, not so much. You know just how torturous the day was for Dimon when the worst part wasn’t his being forced to admit that his bank previously accepted African-American slaves as collateral for loans. That line of questioning came from Congressman Al Green of Texas. 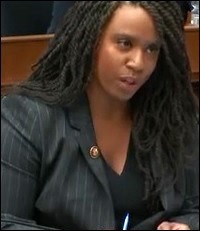 Green said that his ancestors were slaves and asked Dimon if it was true that JPMorgan Chase had released information in 2005 “indicating that it directly benefited from slavery” and had made loans using slaves as collateral. Dimon said he believed this was true. In fact, according to a 2005 report in The Guardian, it was actually worse than that – the bank’s predecessor institutions had actually owned slaves. Two banks that are now part of JPMorgan Chase made loans to plantation owners of slaves in the 1800s, accepted 13,000 slaves as collateral, and “ended up owning about 1250 slaves” when the plantation owners defaulted on the loans, according to The Guardian report. On the point of discrimination, Congressman Al Green had also called to the attention of the hearing room that all seven mega bank CEOs appearing on the panel were white men. To make certain that he had that correct, he asked the CEOs to raise their hand if any were other than white men. None did so. Green then asked the bank CEOs: “If you believe that your likely successor will be a woman or person of color would you kindly extend a hand into the air.” No hands went up. Green pressed on: “Is your bank likely to have a female or person of color [as CEO] within the next decade.” Hands went up among the following CEOs: Michael Corbat of Citigroup; Brian Moynihan of Bank of America; Ronald O’Hanley of State Street; Charles Scharf of Bank of New York Mellon; and David Solomon of Goldman Sachs. 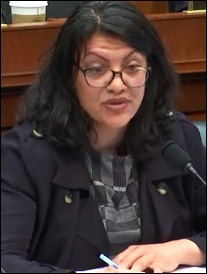 Another tough point for Dimon in the hearing came when Congresswoman Katie Porter of California asked Dimon for help with a math problem since he is so eager to tell the U.S. how to manage its resources. 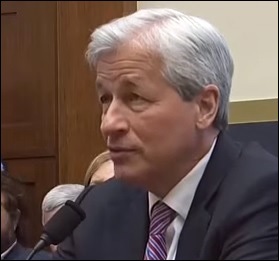 Porter explained how Jamie Dimon’s $31 million in compensation in 2018 compares to what the bank is paying one of its bank tellers who is a single mother with a 6-year old daughter. She says she went to Monster.com and found a job in her hometown of Irvine, California for a bank teller at JPMorgan Chase. 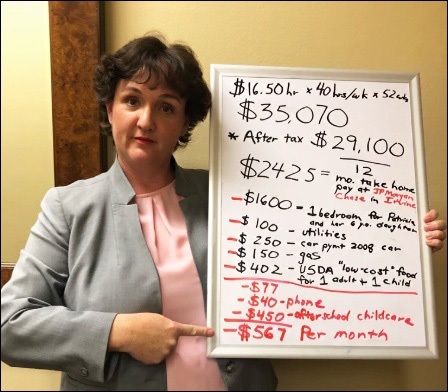 She said the job pays $16.50 per hour or $35,070 per year or an after-tax amount of $29,100 for a single mother with a six-year old child. Another embarrassing moment in the hearing for Dimon, who was testifying under oath, was when he attempted to dodge the fact that his bank forces both its employees and customers into mandatory arbitration and denies them the ability to access Federal and State courts when they have a claim against his bank. Congressman Brad Sherman of California asked the CEOs to raise their hand if they didn’t force their middle class customers into forced arbitration as opposed to allowing them to take claims against the bank through the U.S. court system. Dimon raised his hand. In 2013, one of JPMorgan Chase’s licensed brokers discovered the legal twilight zone one enters when attempting to challenge wrongdoing at JPMorgan Chase. Johnny Burris worked in a JPMorgan Chase branch near Phoenix, Arizona. He complained that the bank was pressuring him to sell its own proprietary mutual funds to clients rather than allowing him the independence to select the funds that he felt were in the clients’ best interests. After Burris refused to sell the in-house funds, the bank terminated his employment. The bank then had one of its own employees draft customer complaints against Burris and file them with FINRA, the self-regulator that also oversees Wall Street’s private justice system known as binding or mandatory arbitration, according to the New York Times. During the arbitration hearing, the JPMorgan employee denied drafting the claims for the customers. The New York Times’ Nathaniel Popper wrote an article in 2015 on the perversion of justice against Burris and quoted the customers, by name, denying that they had made the complaints or had even seen the text of what they were signing against Burris. Editor’s Note: The co-author of this article and Editor of Wall Street On Parade, Pam Martens, was the lead plaintiff in the Smith Barney lawsuit referenced above. She withdrew from the settlement and received no money from it. Together with the New York State and New York City chapters of the National Organization for Women, Martens called the settlement a sham and a travesty of justice for women on Wall Street.